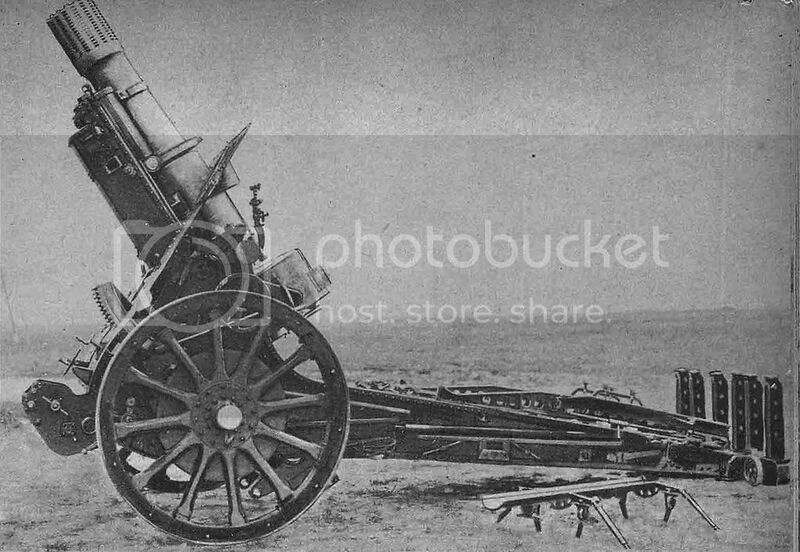 The technical specs for the 220 mm Mortar, sent many years ago ny Herr Franza Kosar:He indicated that the data came froma Schneider catalogue) in respose to my letter enclosing the previous photo of this artillery piece. Transport, in one load: 8.700 kg. I wrote (via ordinary mail) to a friend who until recently headed the Historical Commission of the Argentine Army, just to be informed that he now suffers from Alzheimers. Another veteran of those days,, and one of the few surviving crew members of the Nahuel tank unit, ( as a young Sub-Liuetenant he was ta tank commander) just passed away....R.I.P. The Schneider 220 mm mortar was issued to an Experimental Unit in the Argentine Army and tested in maneuvers. This is recorded and verified by photos. Not verified by evidence, however is a statement made by some English journalist in a book about Peron, in which he claims he 220 mm mortar was used to quell an insurrection that occurred on 28 September 1951,. According to this source, 40-50 rounds of 220mm shells were fired tat the Air Force base in Moron. Unsubstantiated by eyewitnesses. In Any Even, here's a photo taken from a book in my collection. It's part of a seven volume set issued by the Argentine Government: Obra de Gobierno: 1932-38" (Ejército-Ferrocarriles del Estado It is rather well illustrated, and the pictures in the artillery section seem to stem from Schneider originals. 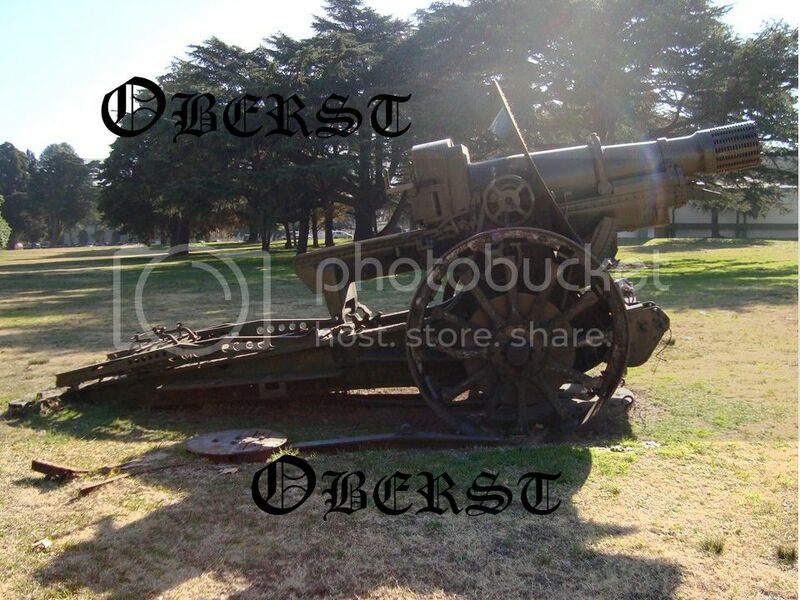 By the way, the color photos of this artillery piece were part of a set taken by an old friend of mine who taught at the Colegio Militar de la Nación, Dr. Julio H. Rubés.. I have a question.. As I posted elsewhere, the Spanish Blue Division (No. 250 in the Wehrmach ) was a volunteer force that fought in the Eastern Front in the Leningrad sector. 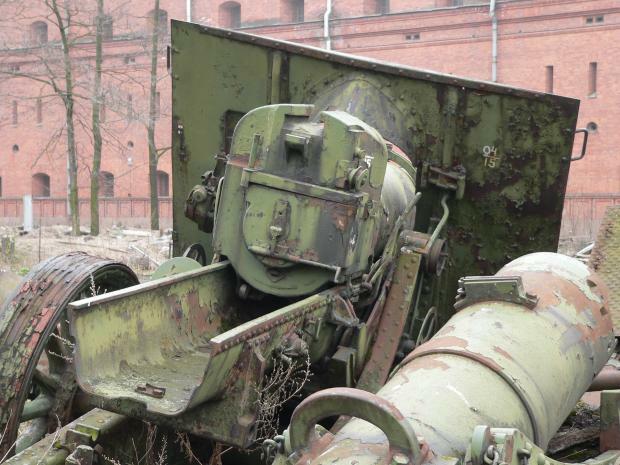 This unit was given some captured Schneider 220 mm mortars.. I wonder if th one shown in your photo could be one of the ones left behind, by the S[anish troops when the Wehrmacht retreated? Any chance of finding this out? This is trophy mortar also known as Mrs.531(f), captured near Leningrad. 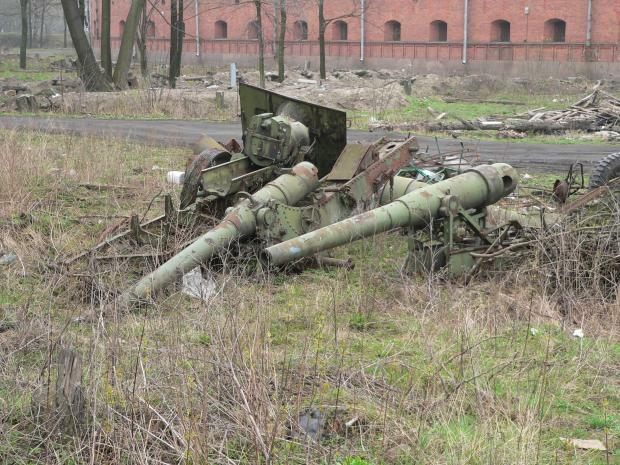 In the backyard of The Artillery Museum is located big collecion of russian and trophy artillery pieces of WWI and WWII. At present, the territory of backyard is in order. 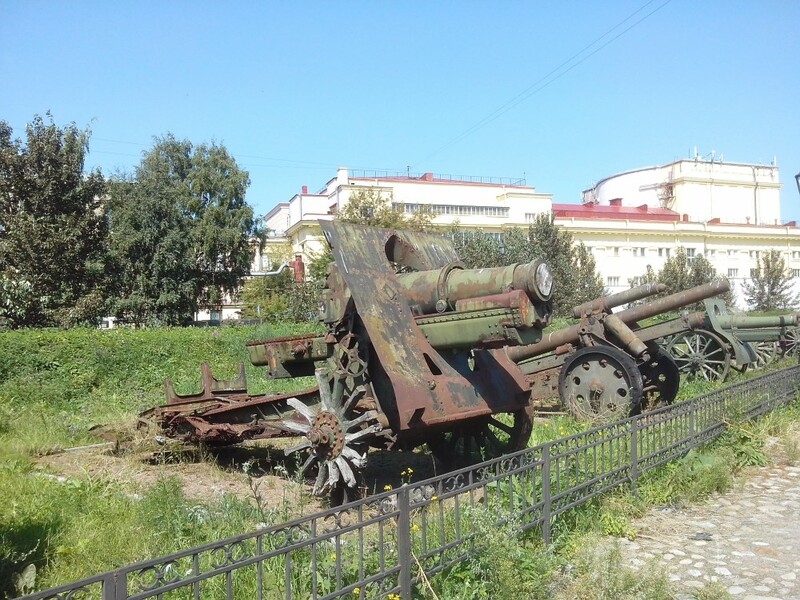 220mm TR Mle 1916 in the backyard of The Artillery Museum, Saint Petersburg. The center of rotation of the traverse turntable that the howitzer British 25 Pounder used is the center of the platform and joined to the carriage, so that it is used to correct large angles in direction, and then adjusted with correcting the steering mechanisms that move the overcarriage. The only possible way to make it work would attach the platform with the wheels and to leave work the direction system that had the mortar. In this case its shape, and possibly how to use it are very different. The yellow arrow points to the large window in the center. The red arrow indicates where the plate ends up. Its form would be approximately like that. Sample files Schneider : "Présentation de différents matériels d'artillerie au polygone d'Harfleur"
where the system is armed with a brick track where it is moved by a lever with a small wheel, the rear of the gun carriage. Although I have knowledge of the operation the others Schneider, because when I did the courses to officer were still in service, this particular model is very little known. The reduced option of carrying (by weight and volume) held him at Campo de Mayo (Buenos Aires). The classic artillery piece with a traverse turntable was the British 25 Pounder of WW2. The variable recoil of the 25 Pounder meant the breech never reached the turntable even at maximum elevation. I guess the Panama mount used for the US-built 155mm GPF guns is a similar idea. Remember a howitzer or mortar which uses a similar system ??? For me, there is no problem in using the pictures, and there is no problem by Professor Carrillo Noble, so they are at your disposal. Indeed, the platform was used for correcting angle to direction. But it was not a conventional platform because in the center has a window that allows to the recoil guide of the barrel reaches an almost vertical position. 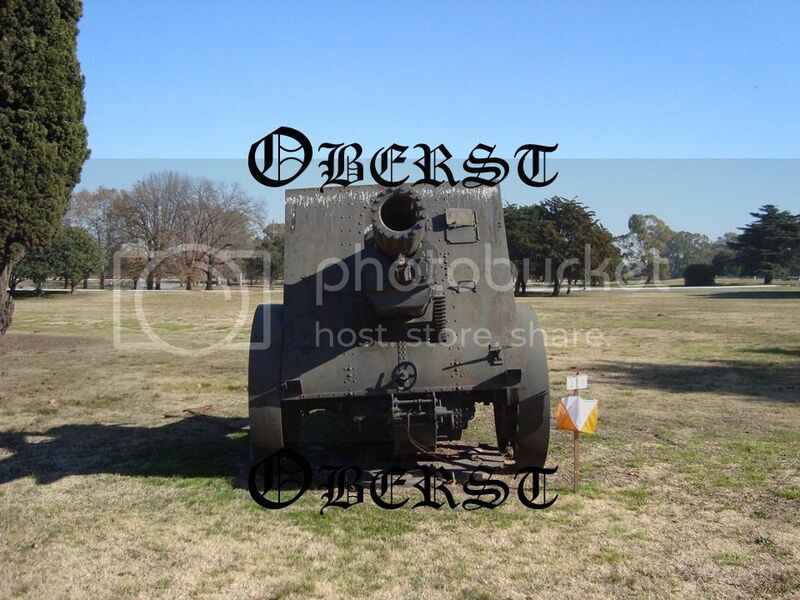 Thank you - may I use the images in an update to the article on Landships II please? The circular platform is more likely to enable easy traverse of the howitzer. 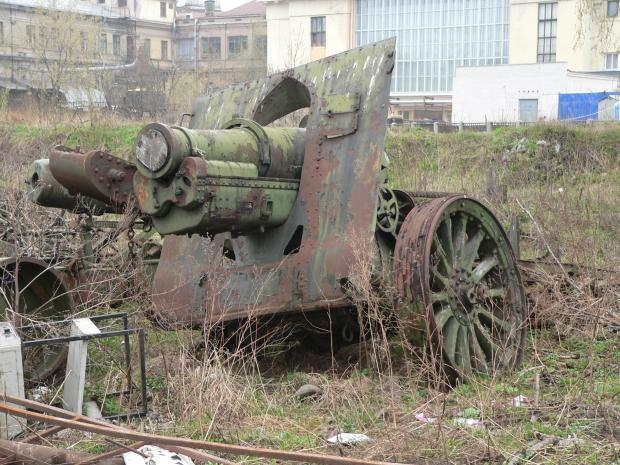 There is another survivor Mortier 220mm Schneider TR in Argentina. It is located in the gardens of the Colegio Militar de la Nación. Prof. German Carrillo Noble gave me some great pictures of this "monster" and authorized me to show them. By the date be deduced that was part the contract of the Argentine Government with the Schneider factory for family of weapons, from a 75mm mountain gun, until guns and howitzers of 105 and 155mm. Was said to be part of the weapons delivered as a sample, since it is one of the Schneider that was not modified and updated, as they did with to the rest of the delivered. This mortar also not appeared in the two middle pages of the book mentioned by a disoriented forum user. Anyone know where this survivor is located?